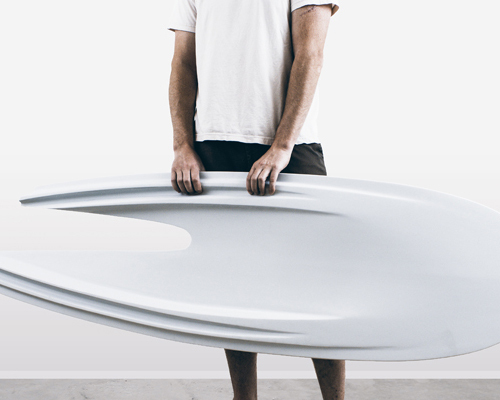 for the architecture and design museum of los angeles, local studio west of west has designed and crafted ‘aero’, a radical board that represents the history of experimental surf culture in southern california. the product is built around a streamlined image of speed. its profile blends the classic outlines of a planning hull with an asymmetrical split tail. while the top surface remains minimal, the bottom is extensively contoured along its length. as a result, ridges and valleys emerge from the massing, forming a new topography that reacts to agility and flow in unique ways. early board shapers in the sunshine state during the 1930s, 40s, and 50s were equal parts artist, craftsman, and engineer. the rugged coastline served not only as motivation, but also as a laboratory and playground. 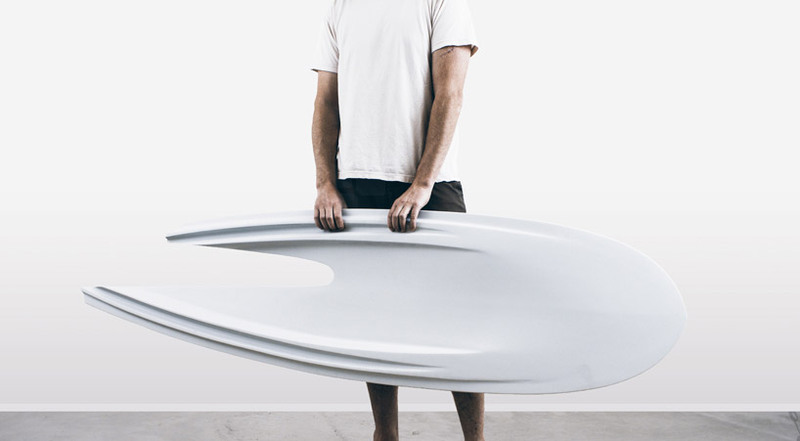 influenced by aerodynamic and hydrodynamic theories, including lindsay lord’s ‘the naval architecture of planing hulls’, iconic surfers such as bob simmons would fabricate their boards and test them the next day. their process of continual trial-and-error dramatically progressed the culture in so many ways that it remains relevant to this day. 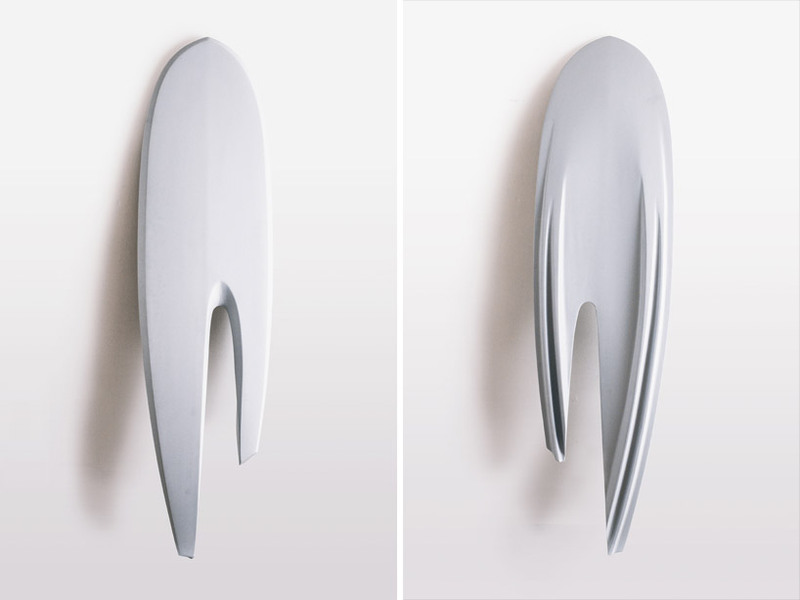 a similar lineage of experimentation forms the basis of west by west’s creation and is fundamental to their practice. 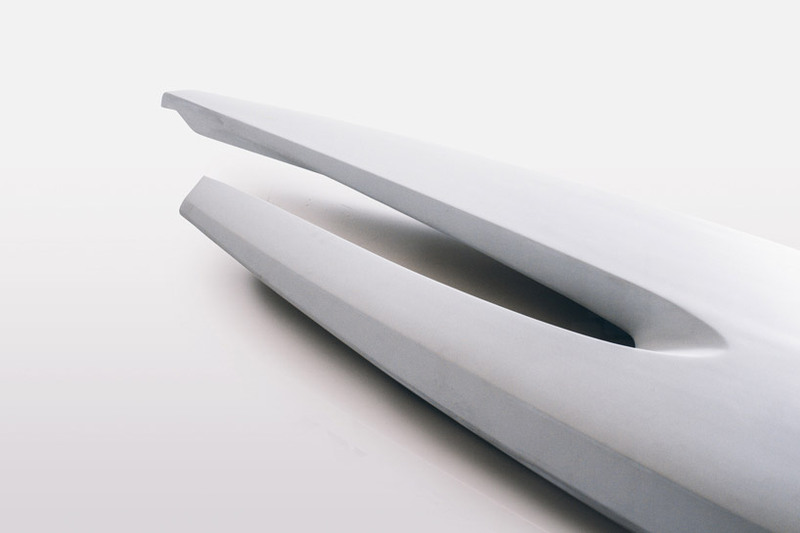 while the early drawings of the design were completed digitally, the physical production was executed by hand using traditional techniques: the profile was sketched on the block of polyurethane foam with a pencil, the overall shape sculpted with a hand planer, and the final contours blended and sharpened with a sanding block. 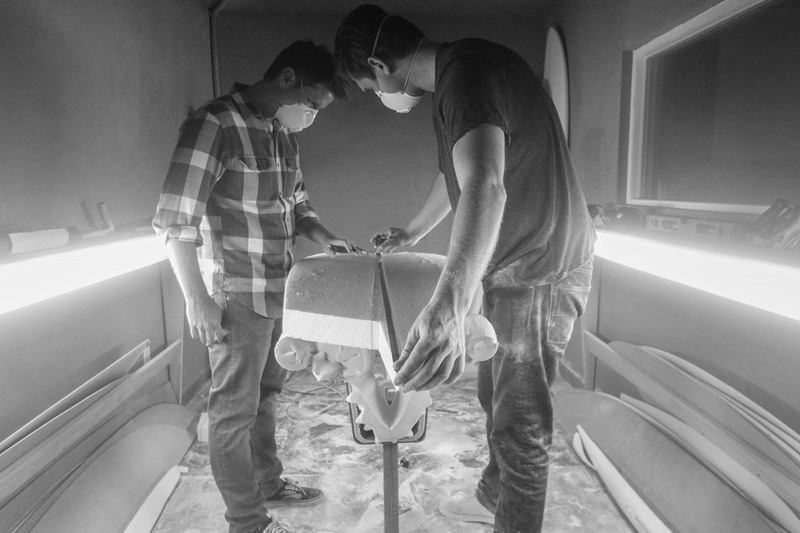 afterwards, it was finished in fiberglass resin with a coat of battleship grey in homage to the naval history that fueled the creativity of surfing pioneers. Dudes were do you put your back foot!? PS – Try a full roundhouse cutty on that baby and see what happens, my guess is nuttin, straight ahead ma man straight ahead !!!!!!!! Q, It’s a large, rounded-pin ..you surf it backwards. Looks like a fish fin. Not sure about the “dagger” like tail ends and the space between them. Seems dangerous even though that they have blunt points. 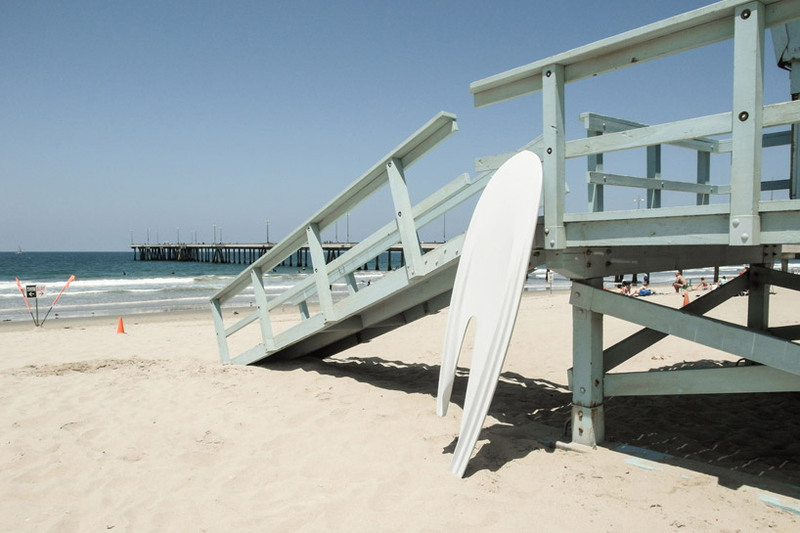 who needs a photo of board on the sand? how about a video of someone on a wave? 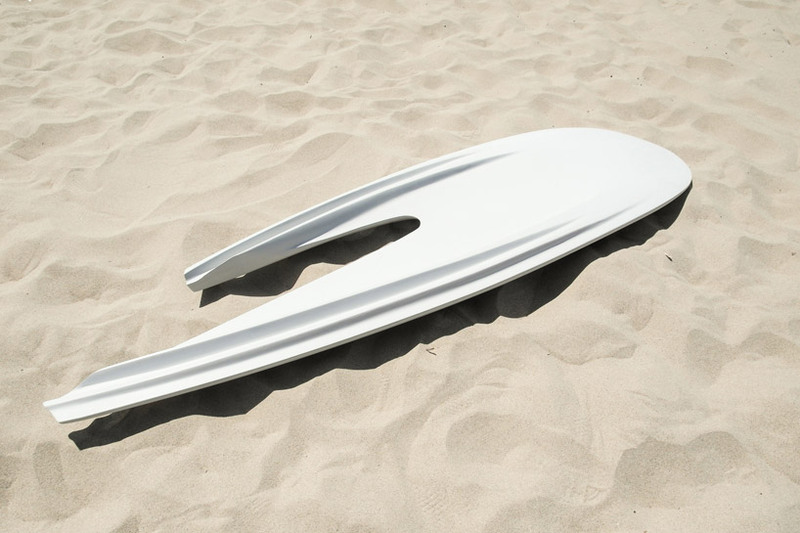 or don’t call it a surfboard. I have only seen one board with a hole in it in Kauai, for a left break only. Function is linked to form directly in a board. Prove it works and ppl will be kinder. otherwise, lesson learned. 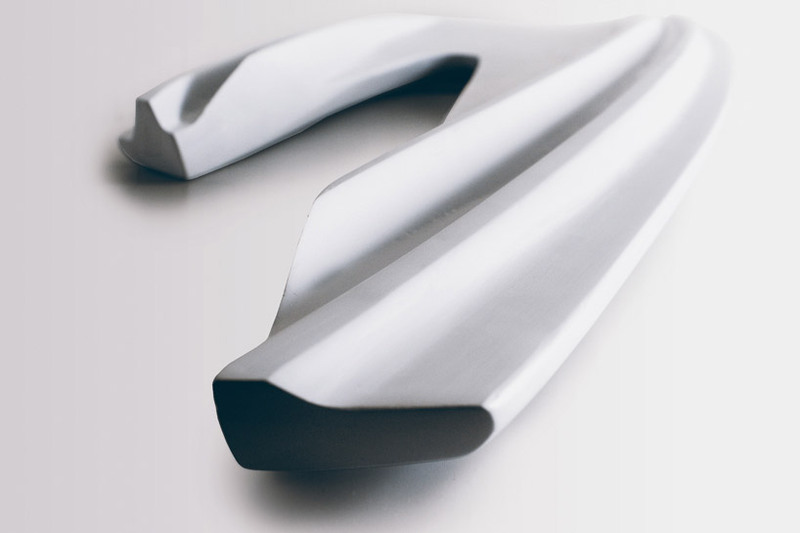 Good design does not come from a random shape. The ribs might give you something to carve a turn against, but where does the asymmetry get you. 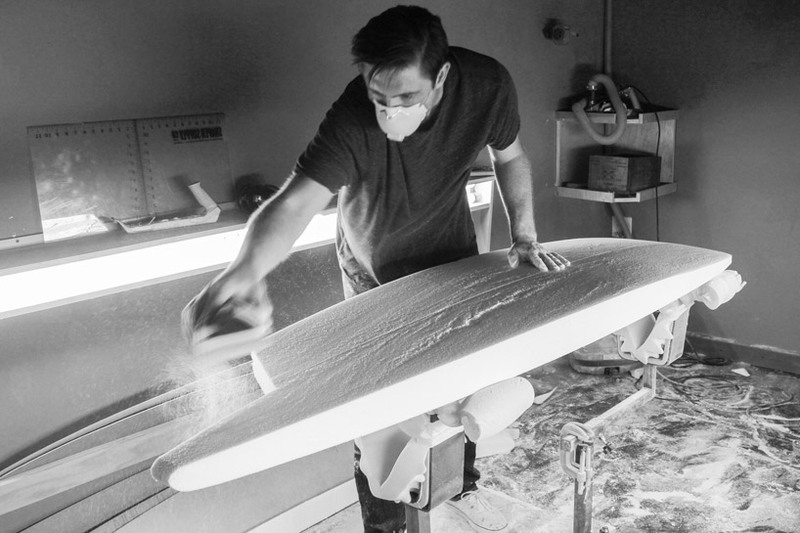 There could be some great ideas in this board, but as the guy says, if it ain’t in the water, it ain’t a surfboard.